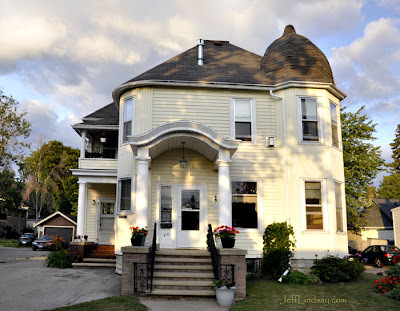 We just had a small family event at the Franklin Street Inn, a bed and breakfast establishment with two beautiful and historical homes in the heart of Appleton, very close to City Park. The facility at 318 East Franklin Steet is most well known, but there is also a wonderful facility around the corner at 310 N. Durkee Street, shown below. We have a little gathering there to celebrate the recent wedding of Daniel Lindsay and Jennifer Yankey on July 10 in the beautiful Washington, D.C. Temple (Church of Jesus Christ of Latter-day Saints). They stayed in the inn on Franklin Street, but our gathering was on Durkee Street. The owner, Judy, is terrific and so helpful. I was very impressed with the service and the low price for such a beautiful establishment. My son and daughter-in-law were impressed as well. Just a beautiful place! Here's a little Youtube offering about the Inn, which I place here just to say thanks to Judy for her terrific work. 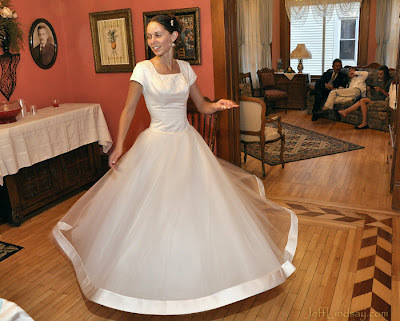 Here's a photo of my daughter-in-law at the Inn. Mystery Photo: Can You Identify These Hands?